Amidst the ongoing festive offers and launches, American car manufacturer, Ford India has introduced a new EcoSport with Signature Edition range of accessories. This updated Ford EcoSport, priced at Rs. 9.26 lakhs (ex-showroom, Delhi) will be equipped with an array of trendy and sporty accessories that alone cost Rs. 37,894, inclusive of fitment and painting. This special edition is based on the sub-four-metre compact SUV’s Black Edition Titanium variant that was launched earlier in 2016. You can expect several cosmetic changes in the exterior profile of the Ford EcoSport that have freshened up the look of the car. Up front, the SUV comes with all-new LED daytime running lamps. According to Ford, the new DRLs significantly improve the visibility in low-light conditions, besides enhancing the visual appeal of the EcoSport. The new silver appliqués on the front and rear bumper of the car add to its sporty stance. Car lovers will also be impressed by the new body graphics on the side profile with the ‘EcoSport’ badging on them. Ford’s new Signature Edition range of accessories will be dealer fitter on the existing EcoSport Black variant that already offers features like – all-black treatment on the exteriors that includes a black grille, black out molded headlamps, 16 inch black allow wheels, black mirror covers, black fog lam bezel, black roof rails, etc. Coming to the interiors, the cabin of the new EcoSport Signature Edition shows off bright, illuminated scuff plates along the black vinyl seat covers with rd stitching. This gives an up-market feel to the interiors. The remaining features of the car are unchanged, such as Ford’s SYNC with AppLink, the carmaker’s advanced in-car connectivity system and safety option of having up to six airbags. Under the hood, the car will continue to come with the choice of the 1.5 litre petrol engine with manual as well as automatic transmission option, a 1.5 litre TDCi diesel motor and a globally acclaimed 1.0 litre EcoBoost engine. While the 1.0 litre Eco Boost petrol engine develops 123 bhp and 170 Nm of torque mated to five speed manual transmission. The 1.5 litre Ti-VCT petrol engine churns out 109 bhp and 140 Nm of torque mated to either manual or automatic transmission. The1.5 TDCi diesel engine is tuned to pump in 99 bhp power and 205 Nm torque mated to five speed manual transmission. Transmission duties are being addressed by the same 5-speed manual gearbox and the 6-speed dual clutch transmission unit. 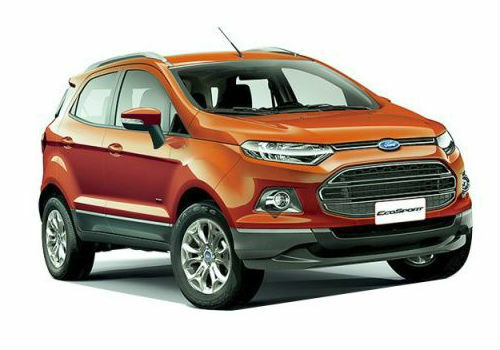 The Ford EcoSport is believed to pose stiff competition for the Mahindra TUV 300 and the popular Maruti Vitara Brezza. In September, the domestic sales of the Indian arm of the US carmaker registered a growth of 9% to 9018 units as against 8274 units in the same period a year ago. However, during the same period, the export of Ford witnessed a fall of 4.11% to 13,572 units compared to 14,154 units in September last year. Automobile enthusiasts have surely more reasons to revel in the festive season now!